Grave’s disease is an autoimmune disorder that leads to over activity of the thyroid gland (hyperthyroidism). An autoimmune disorder is a condition that occurs when the immune system mistakenly attacks healthy tissue. 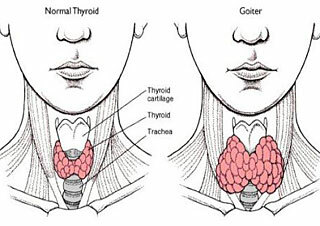 Diffuse toxic goiter: Graves’ disease is the most common cause of hyperthyroidism (over activity of the thyroid gland), with generalized diffuse over activity (“toxicity”) of the entire thyroid gland which becomes enlarged into a goiter. Graves’ disease is the most common cause of hyperthyroidism. It is due to an abnormal immune system response that causes the thyroid gland to produce too much thyroid hormone. Graves’ disease is most common in women over age 20, but the disorder can occur at any age and can affect men as well. 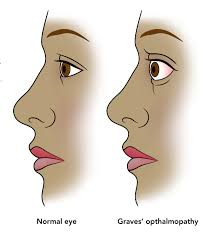 Graves’ Ophthalmopathy is also known as thyroid eye disease (TED), dysthyroid/thyroid-associated orbitopathy (TAO) or Graves’ orbitopath. 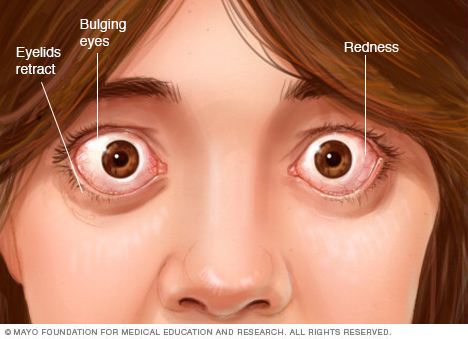 An uncommon manifestation of Graves’ disease, called Graves’ Dermopathy is the reddening and thickening of the skin, most often on the shins or the tops of the feet. Call your health care provider if you have symptoms of Graves disease. Also call if your eye problems or other symptoms get worse or do not improve with treatment.